There's a talent show at school and the prize is too good for Micah to pass up. Will he discover his talent in time to win? 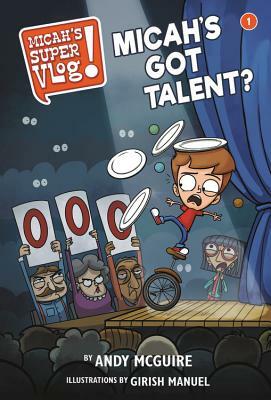 Based on the popular JellyTelly show, Micah's Super Vlog, in book one of this series Micah wants to win the big talent show prize. There's just one problem...he doesn't know his talent. So, he sets out to try just about everything (especially the things his friends are good at) in order to find "his thing." Discouraged with the process, Micah struggles with his identity but finally learns to have confidence that, in time, he'll uncover his special gifts. Andy McGuire has written and illustrated four children's books, including Remy the Rhino and Rainy Day Games. He has a B.A. in Creative Writing from Miami University and an M.A. in Literature from Ohio University. Andy's writing heroes have always been the ones who make him laugh, from Roald Dahl and Louis Sachar to P.G. Wodehouse and William Goldman. Andy lives with his wife and three children in Burnsville, MN. Girish Manuel is the creator of the Micah's Super Vlog video series and a producer at Square One World Media. He lives in a little place called Winnipeg, Canada with his lovely wife, Nikki, and furry cat, Paska. Girish enjoys running and drawing... but not at the same time. That would be hard. He tried it once and got ink all over his shoes.